But that's what exile does. It gives you your home. There is something about recollection that makes the past come out, clear as sometimes mud. In a recent issue of The New Quarterly (104, fall 2007), Ottawa writer Elisabeth Harvor wrote a piece called "First Real Estate: The Childhood Bedroom." In it, she talked about teaching creative writing at the university level to first-year students, and giving them assignments on writing their first childhood bedroom. What comes out of such writing? For a couple of years, I'd been thinking about writing small prose sections or poems to go along with old family photographs, specifically an album of old Polaroids, wandering through the terrain of my own past, and my own childhood. It was terrain I haven’t really gone near previously in my writing, or even my own thinking, and hadn’t quite figured out how to begin. There was something about Harvor's piece that wouldn’t let go, as I started pouring through photographs and half-faded memories. Still, I knew it wasn’t a new idea. Vancouver writer George Bowering had done a version of the same a decade earlier as a collaboration with his late wife, Angela, resulting in a series of pieces called "Pictures" from his poetry collection Blonds on Bikes (1997). Their series, instead, focused on each writing a piece on various photographs, some of which they hadn’t previously seen, or knew nothing or little about. What is it about the past that compels, exploring or even discovering elements of one's own history? There was the American poet Charles Olson's posthumously published memoir on his late father, Post Office: A Memoir of His Father (1975), the memoir Ron Padgett wrote on his late friend, the poet Ted Berrigan, published as Ted: A Personal Memoir of Ted Berrigan (1993), or even the memoir George Bowering wrote on the late London, Ontario artist Greg Curnoe, The Moustache: Memories of Greg Curnoe (1993), where I realized, on the day I was born, the two were sitting with James Reaney in a London kitchen, surrounded by a party. I spent far too much of my twenties and into my thirties focusing on the hardships of growing up, whether real or imagined, through the years of my mother's illnesses, all coming out of the twenty-two years she hadn’t working kidneys, and was living on dialysis. She got quite sick around the time I was four or five, just before they adopted my sister, and her tenuous health was a trauma I have not quite recovered from. There was the year I turned eleven, and our mother went into hospital on New Year's Day. We didn’t get her back until October. 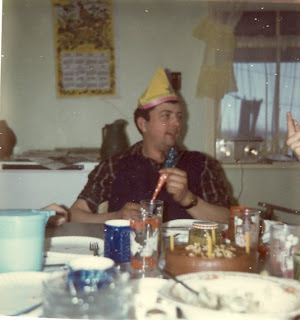 I spent the whole of March break at a friend's house in the village, where they even hosted a surprise birthday party. As I was told later by my friend's mother, my piano teacher, it was also the year of my mother's first failed kidney transplant, with a ten percent chance of her living off the operating table. How does one compete in such a household? I decided quickly: one doesn’t. I quietly taught myself to scrub sinks, do laundry, make meals, mend my father's work shirts. My parents have stories, but they seem not to tell them. I realized that, for the period these pieces cover, from the mid-1970s to earlier, there would be no one else who could tell these tales to my sister, her children or even my own daughter. How would anyone else know about the abandoned chicken coop that used to live in the corner of the barnyard, or the time we weaned baby raccoons with a bottle? How would his grandchildren know of the time when my father still easily laughed, or crossed his eyes to amuse his wife and her visiting nieces? I've realized that around the time my mother's illness took over, family photographs became a rarity. Family trips soon stopped altogether, which were difficult enough before, considering my father's Scottish Presbyterian work ethic, and the fact of the dairy farm. Who would step into that work for days at a time, let alone any way for him to allow himself to step out? 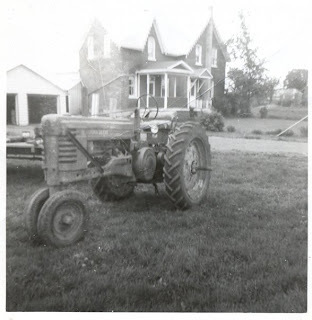 We once drove non-stop from Prince Edward Island back home at the end of a few days away, because he knew that he could. The rest of us were exhausted by the time we pulled into the lane. On the same trip, at a motel in Nova Scotia, my mother said she had to struggle to keep him in bed another hour, meaning he wasn’t up and ready to head out to a quick breakfast and the road until at least 8am. I remember seeing him dressed in the chair at the foot of my bed wondering what the hell he was thinking, and once back on the road, the stops we couldn’t make because it was too early, and nothing was open yet, including the World's Largest Lobster Trap in the distance. What makes up home? Home is a series of recollections, of distances, as easily remembered as mis-remembered, and a blending of events that can sometimes never be confirmed. As Harvor wrote, "As for childhood, most university students don’t write about it at all; it's still much too close to them." Well, why would they? There is something about distance that allows a particular kind of perspective. Is it any accident, perhaps, that this project started suddenly, mid-way through my year in Edmonton? Arguably my first time away from home, I wrote the bulk of these pieces in the Garneau Pub on 109th Avenue, later showing sections to a friend over lunch at the High Level Diner. My subject matter may no longer be temporally close, but neither too distant, either. And why write as a "memoir" instead of calling them "prose poems"? I want these stories not to be misunderstood; I want them to be seen as what I remember, what I believe to be true, from my vantage point of some three decades later, and thousands of miles. It felt like reclaiming something that had been far away for a very long time, but no longer. It felt like bringing out the good out from underneath all the bad that came later, overshadowing so much of what had happened before. related link: list of individual pieces on-line from "house: a (tiny) memoir"